12/3/2018 Update: WUFT’s engineering team has secured a temporary solution to the challenges of the station’s studio-transmitter-link path being disrupted by construction on the University of Florida campus. As such, no additional transmission issues are anticipated as we work with our colleagues on campus to secure a final arrangement that will not be impacted by the current construction project or any future ones on or adjacent to the UF campus. Any questions or concerns can be directed to swagner@wuft.org. WUFT-TV’s broadcast transmission is experiencing periodic disruptions due to interference being caused by the construction of the new College of Engineering building on the University of Florida campus, which is located next to UF’s College of Journalism and Communications, where WUFT-TV is located. 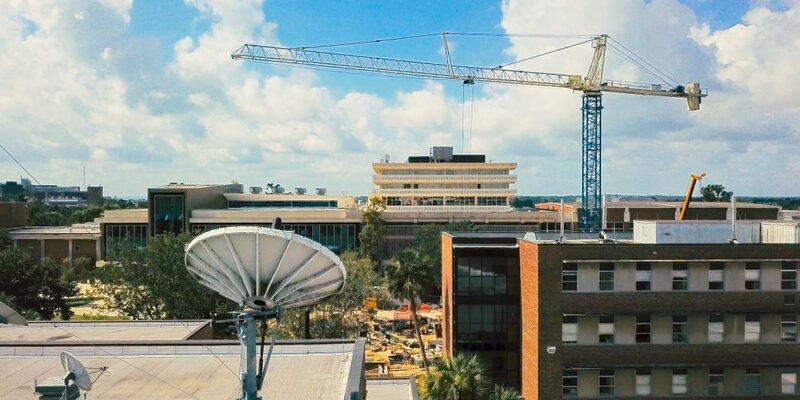 Large cranes, which have been moved in for the engineering building project, are causing signal issues with the studio-transmitter link or “STL” that sends our WUFT-TV programming to the transmitter site in northwest Gainesville. The cranes are typically locked down during the day, which keeps disruptions to a minimum, but are unlocked evenings and weekends to allow them to move freely during times of bad weather. Unfortunately these movements can cause disruptions to our STL link which, in turn, cause issues in our ability to deliver the highest quality over the air signal to our transmitter and viewers throughout north Florida. Unfortunately the number of disruptions has been higher than anticipated or desired. A permanent solution is in process but will likely take another 6+ weeks to complete with a target of late September. In the interim we are working with the University’s construction project planning team to minimize the issues as much as possible through a number of potential short-term solutions. We appreciate your patience and understanding and please know that we are doing everything we can to ensure WUFT-TV’s transmission remains reliable and of the highest quality.